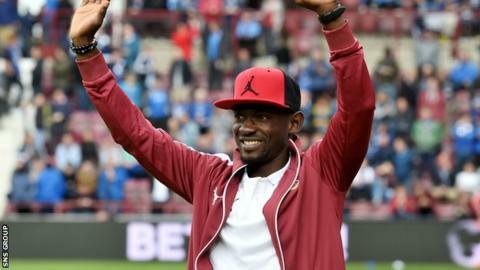 New Hearts signing Juwon Oshaniwa says his three-year Tynecastle deal is more than a route into British football. The Nigerian international left-back was courted by several UK sides prior to signing for the Scottish Championship winners. "I've got my personal target ahead but not presently, I'm in Hearts - it's how I see myself aiding this team to greater levels," he told BBC Scotland. "Even if I'm going to leave, I'm going to leave a positive legacy behind." Oshaniwa joins a Hearts squad in which precocious local talents like Sam Nicolson, Callum Paterson and Jamie Walker have been blended with experienced foreign acquisitions by head coach Robbie Neilson. "They've got a culture of bringing up young players and letting them go," added the 24-year-old new arrival. "They've got some aged players to aid the team, and this is the reason I am here, to help the younger ones to grow. "At the end of the day, (the experienced players) make our move and give more room for other people to come again, the culture continues to move. "On the pitch, off the pitch you need to be professional, you need to have a focus. Gone are the days you just sit in your home and become professional. "You need to fight for it, on the pitch, off the pitch. At your leisure time, you think football, you eat football, you drink football, and see yourself getting to the utmost place. "This is what we need as a young player to always have at the back of our mind. Football is difficult, but you can make it easy when you continue to work towards your target, your goal, you never say die, you never give up, you keep pressing until you get there." Captured from Israeli outfit Ashdod, 17-cap Oshaniwa was presented to the club's supporters at half-time during Sunday's frenetic 4-3 victory over St Johnstone, after visa issues delayed his arrival in Edinburgh. "It has been a lot of stressful stuff to process me being here," he added. "My last competitive game was the last game of last season on 16 May. I don't want to rush anything and you can see I never passed through any of the pre-season with the team. "I believe it's gradual process, I'll take my time to start, but if you see me on the pitch against Dundee (on Saturday) you shouldn't be surprised."